How to Recover Lost/Deleted/Formatted Data on Windows 10? Windows 10 provides users with more powerful new features, better user experience. More than 60% of Windows users expect to upgrade to Windows according to a research. But you are at risk of data loss when you upgrade OS to Windows 10 because the whole process may change the partitions or overwrite the original data. When you happen to get your data lost in Windows 10 or other OS versions, will you ask why? How do you lose your data? What may cause data loss problem? 1.OS upgrade or installation: sometimes OS upgrade or installation/re-installation can cause data loss. To avoid this, you need backup up data. 2.Careless operation or improper operation: careless deletion, formatting or partition deletion can all make your data lost. 3.System error or crash: this is unavoidable when the system crashes or a system error occurs. 4.Virus/malware/spyware: virus attack can also cause serious data loss trouble. How do you get your data lost then? Other unknown reasons? Indeed, some unknown reasons may also cause data loss trouble. How to solve such a trouble then when data get lost with Windows 10? Are there any Windows 10 data recovery software can do the job? Sure! Double click the installation package to install the free trial version of Windows 10 File Recovery on your computer. After that, click the app icon to run it. On the main screen, select the file recovery mode you want. All the internal & external drives will be detected by the program and be listed on the left panel. 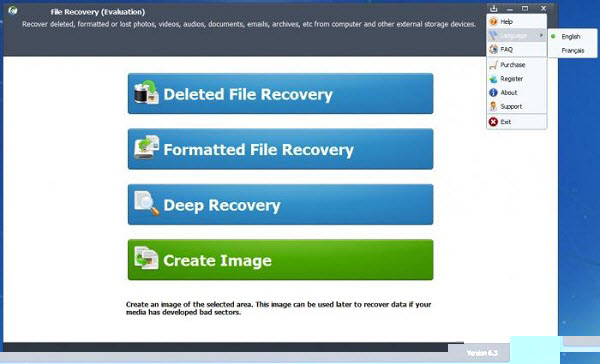 Select and check the drive that you want to recover files from. Note: if you want to recover files from external storage device, please connect the device to Windows 10 computer first. Go to the “Advanced Scan” tab, select the file types you want to recover in the file list tab. For example, if you only want to recover jpg files, make sure you select jpg only. This will greatly improve the file scanning performance. Check the files you want to recover, then hit right-bottom “Recover” button to start the Windows 10 file recovering process. Lost .DIR Recovery-How to Recover Files from Lost.Dir in Android or SD Card? How to edit Canon XF200 MXF videos Pinnacle Studio on Windows without issues? How to import Sony PXW-X70 XAVC files to Windows Movie Maker for editing? How to Recover Lost Text Messages from Samsung Galaxy J7 V? Top 5 Blu ray Movies and How to Play Blu ray Discs on Windows 10 PC?